There were no surprises for top seeds in the first two rounds of the 35th Annual World Amateur Go Championship in Gyeongju, Korea on Sunday, July 6. In the first-round Japan-Hungary match, the game reached an essentially lost position with only three minutes used on Pal Balogh’s clock. After a twenty minute deliberation, the Hungarian left the playing room but returned minutes later to choose the only possible continuation and struggle through a futile battle to the bitter end. 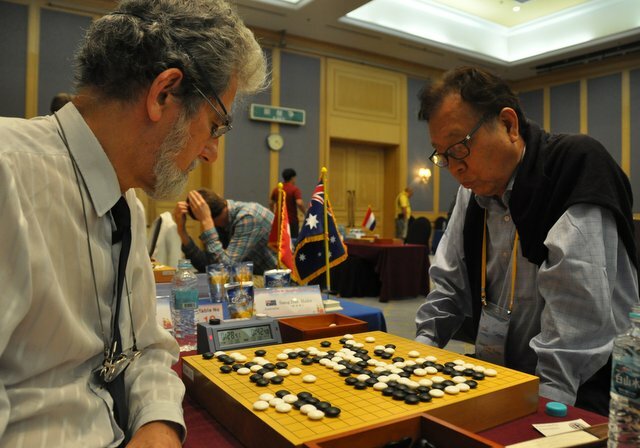 In the Hong Kong-Netherlands game, Naisan Chan (at left in photo) enclosed the Dutch envoy’s central-right stones in another first-round battle but no amount of tsumego wizardry could save Merlijn Kuin’s (right) group from inevitable demise. “I thought W58 was good enough but to be honest I didn’t read it out very carefully,” said Kuin. “I should have taken more time to consider my options.” Click here for the Hong Kong-Netherlands game record. Other interesting first-round games included Costa Rica versus Belgium, this year seeing a new player, the Costa Rican system engineer Luis Enrique Boza Araya, attempt a tengen-based strategy. He was unable to use the central stone, however, and suffered a crushing defeat at the hands of Belgian accountant Dominique Versyck. Suzanne D’Bel, known by the Japanese press as ‘Tengen Girl’, took white in her game against Andreas Götzfried of Luxembourg, so we have yet to see if she too will employ this unusual opening strategy. Sweden-US: Jie Liang (US) let his advantage slip away in the middle game as Sweden’s Fredrik Blomback squeaked out a narrow win. Click here for a game commentary by Kim Seung Jun 9P of Blackie’s International Baduk Academy (www.bibabaduk.net), with assistance by Shawn Ray 4D. Lithuania-Canada (click here for game record): As to be expected in a match-up between a 3-dan and a 7-dan, Canada’s Ge (below at right, reviewing the game) cruised to an early lead; the middle-game death of one of Petrauskas’ (Lithuania) groups simply hastened the inevitable. After a lunch of fish and assorted kimchi, the players returned to the underground playing area for the second round. Within fifteen minutes Hungary’s Pal Balogh’s game had yet again finished in a flurry, but this time with victory over Khatanbaatar Tsend-Ayush, a hotel manager from Mongolia. Also quick to finish was the US-India game, both players playing very rapidly until the end. Soon after, South African John William Leuner was defeated by Danish postman Arne Steen Ohlenbuch when his group became entangled in a web of black stones. This was not the only spectacular game of the afternoon. A large crowd gathered around the Indonesia-Luxembourg match-up as semeais erupted and dead stones littered the board. Malaysian representative Suzanne D’Bel launched a fierce attack on Brazilian Csaba Deak and, although he managed to dodge this assault, another group came under fire, leading to a decisive victory for D’Bel. But the bloodshed didn’t stop there. 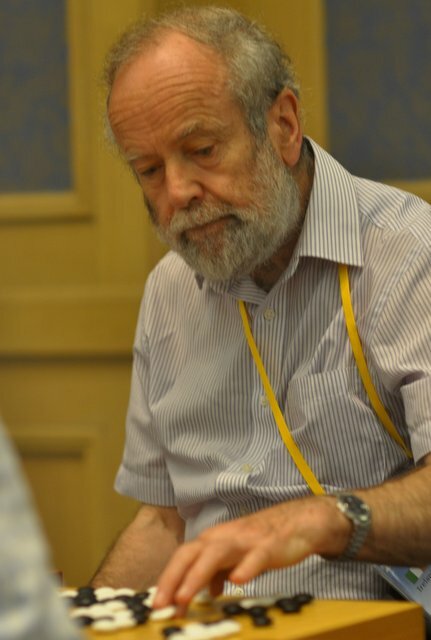 An audible groan was let out by the UK’s Francis Roads (at left) as he tried to find a way to save his group from Australian Sangdae Hahn’s deadly onslaught (click here for game record). Not finding a solution, the stone in Roads’ hand was slammed back into the pot, followed shortly by resignation. The candidates from Costa Rica and Portugal joined the list of casualties as large groups were swallowed up by their Belarusian and Lithuanian counterparts. No suprises again at the top, as Korea, China, Japan and Chinese Taipei all won their games. A highlight was Korea-Canada, with Canada’s Yongfei Ge, back again from last year, putting up strong resistance in a relatively peaceful game. His 45-point lower side was not quite enough to overcome Taewoong Wei. Japan vs Singapore took the longest to finish but in the end Kiko Emura’s lead in territory sealed another Japanese victory. - Game reports by John Richardson, game records by Chris Garlock, photos by John Pinkerton and coordination by Ivan Vigano. Click here for Ranka’s complete reports on the first round and second round and here for complete results.